This small group of women are all mothers who wanted to increase the cash coming into their households. They identified a small market niche that they could fill using the skills they had at hand—this was to supply the local schools with graduation garments or togas. 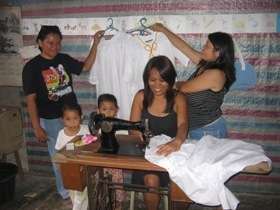 Some of the women had received sewing training and one had an old sewing machine. By visiting the schools and talking to the principals and teachers the women found out that most schools in Jagna were hiring their togas from adjoining municipalities. They were interested enough in having a local source of garments to hire that the schools advanced the cash needed to buy the material and thread for production. 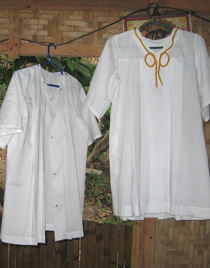 The Dressmakers of Jagna initially made 70 graduation garments—caps and togas—and started to hire them out. Since the project ended they have continued to add to their collection, using their earnings to buy more raw materials. This enterprise generates small amounts of cash income for the women concerned which they have used for school fees and household items. The young mothers feel proud of their business and after initially being treated with skepticism, are receiving support from their husbands and neighbours.